Google Analytics (GA) is far and away the most popular website analytics and reporting tool available to Internet professionals. Despite this, there is digital life beyond GA. Let's explore four Google Analytics alternatives, which are worth exploring. A comprehensive real-time Web analytics solution, Clicky answers the who, what, when, where and how for site owners and marketers. From heat maps (view where individual users, or even segments of users, are clicking) to on-site analytics (see how many total visitors are on a site and on specific pages) to uptime monitoring (alerts get sent when the majority of five geographically spread monitoring servers agree a site is down), Clicky gives businesses everything they need to monitor, analyze and react to website traffic for about $10/mo. for 1,000,000 monthly page views. 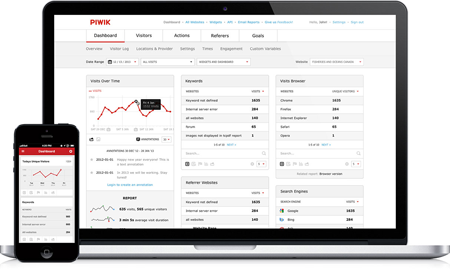 An open source Web analytics platform, Piwik gives companies insights into their website's traffic, visitors, marketing campaigns and more. For example, users can see where their visitors are coming from (referrers), which pages are most popular, how often visitors come to the site, etc. Piwik is used by individuals, small companies and large enterprises. What's more, Piwik can be downloaded free. Finally, Piwik offers a free app for both iOS and Android phones and tablets. The most expensive GA alternative mentioned so far ($200/mo. for up to 500,000 events/month), KISSmetrics may also give marketers a more complete picture of their website, users and campaigns. For starters, KISSmetrics connects all its data to one person - giving companies the ability to see how a user moves from campaign, to the site, to mobile, etc. 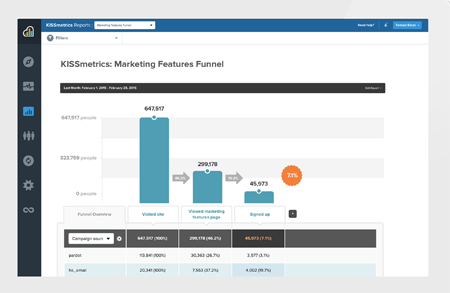 KISSmetrics also shows companies how they can increase conversions on their site, so a marketer's time is freed up to optimize other campaigns for ROI. Very much a "who," website analytics option, Woopra builds customer profiles so marketers can use them to show personalized content to users or send real-time notifications. While Woopra does offer traditional Web analytics options (like people on the site, new and return visitors and the actions they are taking), it goes a step further with reporting on product upgrades and downgrades (and the dollar amount assigned to those), sign-ups and even where users drop off in the conversion funnel. Finally, it should be noted that website visitors may start off as anonymous, but Woopra tracks them from their first touch until they identify themselves and a customer profile is complete. Woopra costs about $80/mo. 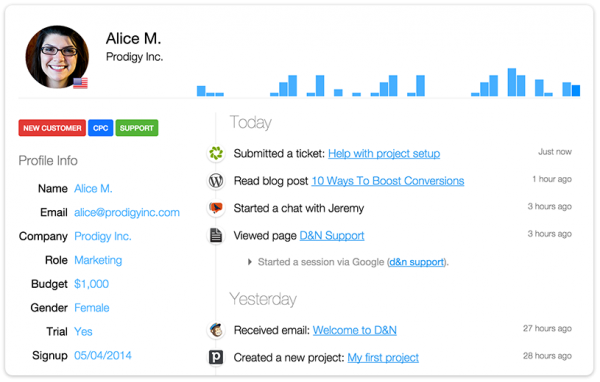 for 400,000 actions (any activity a user performs on a website or app).